When we took a look at the original Ragdoll Blaster, we were quite impressed by the crafty blend of ragdoll physics, puzzler and hand-drawn, cannon-fed craziness. Backflip Studio has strapped on its helmet again in their second iteration of the series with Ragdoll Blaster 2 [App Store]. 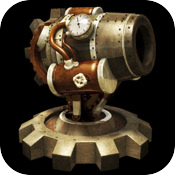 The sequel reveals a more polished title than the original, discarding the hand-drawn art and instead drawing heavily from the steampunk genre to create a rich game world of oiled cogs and shiny bronze contraptions. It is thanks to these machinations that the gameplay in Ragdoll Blaster 2 does vary a little to the original, if still sharing that same overall feel of blasting (and resetting) over and over again until you reach your target in as few shots as possible. The new objects you’ll come across include teleporters, additional cannons, objects that adversely affect gravity, ice blocks and mechanical arms to name a few, along with the expected array buttons, cogs and switches. All in all, levels feel more purposeful thanks to the new mechanics, and we’re confident that the 150 levels that make up Ragdoll Blaster 2 will continue to be interesting (and undoubtedly difficult) and show the same attention to detail throughout as the ones we’ve played up to now. Backflip Studios have also made the decision to incorporate the Plus+ platform in Ragdoll Blaster 2 to provide high scores for each of the nine ‘rooms’ which theme the levels. Both a Par score and Best score is displayed at the end of each room as a target to beat for those competitively inclined. We’re enjoying our time with Ragdoll Blaster 2, though it does still feel very familiar. Certainly, if you’re a fan of the first title, we see no reason why you shouldn’t thoroughly enjoy the new features on offer. (And if you haven’t had a chance to try the first, we highly recommended it) Impressions from our readers are collecting in our discussion thread and to date seem largely positive. 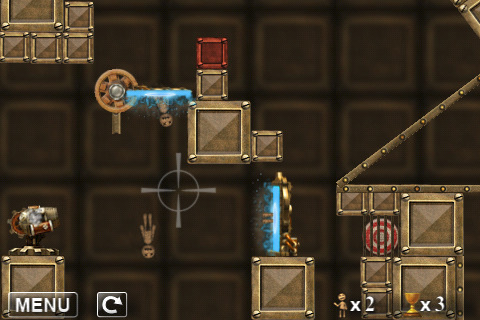 App Store Link: Ragdoll Blaster 2, $2.99.